Communication systems typically fall into one of three categories; Digital Matrix, Two-Wire Partyline, and Wireless. Each type has its strengths and weaknesses and can play an instrumental role in live event production. In order to focus on wireless intercom technology and how it can enhance communication for production of live events, it is necessary to provide a short overview of the other types of intercoms. Digital matrix intercoms are becoming more prevalent in recent years. Formerly relegated to use only in the largest and most complex scenarios, their flexibility has made them quite popular even in mid-sized productions with more complex production needs. They employ four-wire technology (one pair for send, one pair for receive), and can interface with POTS lines and standard audio paths, both digital and analog. One of their biggest benefits is that they enable point-to-point communications, allowing users to conduct numerous private conversations within the system. However, they are typically complex to setup, use and are very expensive. Two-wire Partyline intercoms are typically found in almost all live productions. They can range in size from a power supply and some beltpacks to multi-channel systems, interfacing to a variety of external interfaces and devices. They are easy to set up and use regular microphone cable (one pair for both send and receive simultaneously). Partyline systems are simple to operate, but generally are constrained to four or fewer groups (lights, sound, production and video, for example) or conversations and do not permit point-to-point communication. Wireless intercoms are most often used in conjunction with wired intercom systems, but are in some cases used as standalone complete communications platforms depending on the needs of the individual event. Wireless intercoms facilitate individual user mobility, which is tremendously beneficial as crew members go about their various tasks. Older or less advanced wireless intercom systems offer a wireless partyline-type configuration that allows groups of people to talk on one or more channels. Recently though, more sophisticated wireless intercom systems have offered point-to-point communication paths, multi-location seamless roaming, and other advanced features and functionality that have greatly increased the usefulness of wireless intercom systems. These new capabilities have made wireless intercom systems an indispensable part of virtually all live event productions. Wireless communications in professional live event production environments isn't always easy. Finding available spectrum that is not being used for wireless microphones, IEM/IFB or other high priority wireless devices can be very challenging. Today, communications professionals regularly face new challenges, such as greatly reduced RF spectrum, higher wireless user counts, larger and more complex physical footprints, and highly customized, dynamic talk-path configurations that can make some events almost impossible utilizing older partyline type, single coverage area wireless intercom systems. 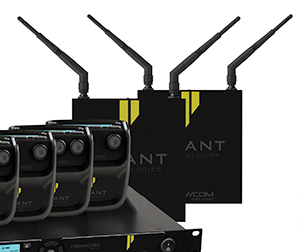 A new wireless intercom system, CrewCom, by Pliant Technologies, gives communication professionals the tools necessary to overcome today's challenges and meets the needs of widely varying productions. The system's distributed, decentralized architecture enables up to 1024 unique conversations (conferences) that are available to any wireless user. These conferences can be point-to-point conversations or include many users (partylines). This configuration effectively combines the best of digital matrix and partyline intercom systems while maintaining a powerful, yet familiar and intuitive user interface at the radio packs that lends itself to short learning curves and error-free operation. CrewCom is equally well suited to small, wireless-only applications as to large, multi-coverage-area configurations. CrewCom utilizes a frequency-agnostic network which allows Radio Transceivers (RTs) to be located wherever wireless coverage is needed. Up to 200 total wireless users are supported and each wireless user can roam seamlessly from one location to another. New technologies like CrewCom are making it possible for entertainment and production professionals to conquer the ever-increasing challenges in today's production environments. Wireless intercom systems have made great advancements in recent years. New technology allows communication professionals to handle the ever increasing communications needs of live event productions. Choosing the right wireless intercom technology is a key factor in live event production today.